In this interview, Brian Hoff, an experienced freelance designer, will share his thoughts on the topic. Why did Brian quit his job at Apple to start his own business? How did he build a popular web design blog that brought him loads of clients? How does Brian makes sure that he is getting things done as well as spending enough time with his family? How does he handle the lack of financial stability that is an inevitable part of being a freelance web designer? What is his advice one piece of advice for those who of you who want to become freelance web designers? My name is Brian Hoff. I’m a professional web and interaction designer. Over the years, my work transitioned from logo design to web design to interaction design. I’ve always enjoyed various elements of design, not to mention I get bored easily, so this transition comes as no surprise to me. These days I mostly work on interaction design (iOS, web apps) though. I also write for my blog, The Design Cubicle and work on my own products (I have two ideas in the works at the moment) when I can find the time. IxD: what interaction design is all about? Goal-oriented design. User usually have a specific goal in mind when using an application. This means that an application should be able to do that one thing really well. Conducting an extensive user research helps interaction designers to create the right balance between form and function. Usability of the design. Applications must be easy to use in order for people to want to use them. Interaction designers aim to create interfaces that makes the underlying systems easy to understand. Affordances. Many things are designed in a way that they are easy to understand even for someone who has never encountered them before. Say, you would probably be able to figure out how to use scissors, even if you would be seeing them for the first time in your life. Interaction designers aim for this same effect in their work. Interaction designers stay involved throughout the whole development process: they form a design strategy, identify and wireframe key interactions, and then prototype interactions. According to Andrew Maier, on whose article this short summary of interaction design is based on, one of the hardest part of being a practicing interaction designer is the speed at which the industry change. Paper Prototyping: The Fast and Easy Way To Design And Refine User Experience” by Carolyn Snyder. Still aren’t sure that you understood what it’s all about? Take a look at interaction design section at Behance! “I took the traditional route. I went to school. Majored in Graphics and Interactive Design. Got my BFA. I’ve always been very intrigued and lured into design, though. While I did go to school for it, I consider myself self-taught for a large majority of it. What is your professional experience prior to becoming a freelance designer? At one point, you were working 9-5 at Apple, freelancing on the side, and blogging on The Design Cubicle. How did you find time and energy to juggle a full-time job, client work, and a blog? What would you advise to people who would like to start freelancing on the side, but struggle to find time, energy, and motivation to do it? You had a stable job at Apple as software/hardware trainer, yet you decided to quit in order to become a full-time freelance designer. What were the reasons behind this decision? Wasn’t it scary to take a leap from a secure job at a big company to uncertainty of freelancing? How did you prepare for this transition? What would you advise to those who are thinking about becoming full-time freelancers? “The main reason was that I needed to design. It wasn’t even that I wanted to design, I needed it. I know, sounds like a typical artist’s statement, but it’s true. It’s my outlet. The itch that needs scratching. Also, at that time, I wasn’t married, I didn’t have kids, so the risk for me was relatively low. Obviously, there was the risk of not making any money and being kicked out of my apartment, but I knew that in the worst case I could always go do something else. Plus, I made sure that I have enough money for a couple of months in case things are slow. One of the biggest challenges that freelance designers have to face is that constant need to get clients. What do you do to ensure that you have enough work every month? What would you advise to freelancers who would like to get more clients, but aren’t quite sure how to go about it? “I’m in a fortunate spot where clients come to me because of the popularity of my blog and other outlets (Behance, Dribbble). Also, do good work. Always try to do your best at each project and then some. Goes without saying but doing good work and putting it out there gets more good work. However, context is important, and a simple online portfolio doesn’t have enough context. I once had a portfolio that was basically a bunch of screen-shots and didn’t show who I was as a person. That’s why I started documenting the process of creating a particular design on my blog. This way, clients can see how I run my business, how I work, and so on. That comes over time, I promise. Nowadays I can tell how the client is going to react throughout the entire process. For example, there are clients that need to have their hand held, meanwhile other clients are very hands off. You can really get a feel for that just from talking to them. Before I start working with any new client, I have them fill out a worksheet. It’s amazing how simply reading responses to the worksheet tells me. One example would be clients that give a one word answer to every question. Basically they are telling me ‘I don’t care about the project’. That’s just not the type of person that I want to work with. If they want me to care about the project, I feel that they should care at least as much, if not more. There are still times when I find myself working with “bad” clients. However, I mostly find it’s the designers fault. I’m the one that needs to be managing the clients, managing their expectations, so it’s usually the result of me not doing something correctly. They choose to work with me not only based on my portfolio, but also my creative process and business process. That’s why it’s important to be vocal. I’m not afraid to tell a client “Your idea won’t work and here’s why..”. The aesthetics of design can often be subjective so I don’t tell people “it’s crap because it’s crap”, but if I truly believe that it’s a terrible idea, the client is going to hear it in a way that has value. And in regards to them being stingy with money.. Well, the way I see it, I have my price and I’m upfront about it. I base it on a set of deliverables. I don’t do hourly rates. I quote a project for deliverables over a time frame (like, you need these 6 pages over 6 weeks, here’s the price). Design is an investment of time and end value. My price is my price. I feel like you have to have your minimum rate and a rate that you want, so if a client can’t afford the rate that you want, you can knock it down to your minimum rate if you really need the job. However, when you go below your minimum rate you are only hurting yourself, because in my experience, working on crap projects just brings more crap projects. It’s weird how it works like that, but it just does: bad clients breed more bad clients, bad works breed more bad work. People often don’t realize how hard it can be to have a right work-life balance when you are self-employed. Maybe you can tell us how does your day look like? What do you do in order to stay productive while still having a life? What would you advise to freelancers who struggle with getting things done? Well, to get work done, you just need to be a good manager, you have to say “These are my work hours” and stick to it. That’s exactly what I did when I started working as a full-time freelancer. My day starts around 6AM. I don’t work past 6PM (technically, my day ends at 4PM, but if I really need to I can extend it until 6PM). I also don’t work weekends. This leaves me plenty of time to go outside and do something outside (which I really enjoy). It’s good because it allows me to get my work done and then take a break by spending the rest of the day with my family. Breaks are good for creativity. It’s hard though. I have an almost two-year-old, and my wife is home with our son, so if I don’t have my headphones on I can hear them downstairs, and it’s hard not to go downstairs and spend time with them. I do that sometimes, but I make sure that if I go downstairs to see what’s up, I spend no more than 10 minutes on that. I see it as basically an equivalent of chatting with a co-worker next to a water cooler in the office [laughing]. It takes discipline. You need to set your work hours at the very beginnings. I know some guys who work at night, who work weekends, and so on. I don’t know how they do it, especially if they have families. That’s just a way to burn out in my opinion. One of the main disadvantages of being a freelancer is lack of financial security, you never know how much you’re going to earn, clients disappear, then your car breaks. What do you do in order to make yourself as financially secure as possible? What would you advise to people who want to become full-time freelancers, but are worried that it might lead to a financial disaster? “Many people think that when they have a job at some company they are financially stable, and that couldn’t be further from the truth. They can get fired at any time. Longevity is not in your hands. There’s nothing more or less financially stable in working for yourself vs. working for somebody else if you have a dependable business plan. Also, when you work for a company, you get the same salary every month. It’s true that as a freelancer, you can end up making very little money on some months, but you can also make double or triple your usually monthly income on others. I think that’s what’s fun about running your own business. It pushes you to work little bit harder to make that extra money. I’m a small corporation. That’s why, as weird as it’s sounds, I pay myself a salary. Me and my wife sit down together and see how much we need to cover our bills and have a little bit extra money left every month. That’s what I take out as a salary. You have experience of being employed by a big company and being self-employed. What are the advantages and disadvantages of both? Why did you decide to stay self-employed? What would you advise to our readers who are not quite sure which way they want to go? “Working on your own, and doing it successfully, brings a quality of life that’s difficult to comprehend. And I don’t mean that from a money profit standpoint. When I need a day off, I don’t have to go to my boss and ask for a day off, I just take it. Sure, it means that I will have to work harder the next day, but that’s okay. There’s nobody managing me. Working for myself also gives me an opportunity to choose which clients I want to work with. I enjoy working with digitally focused people, with online, forward thinking goals. I get to pick and choose the people I want to work with. 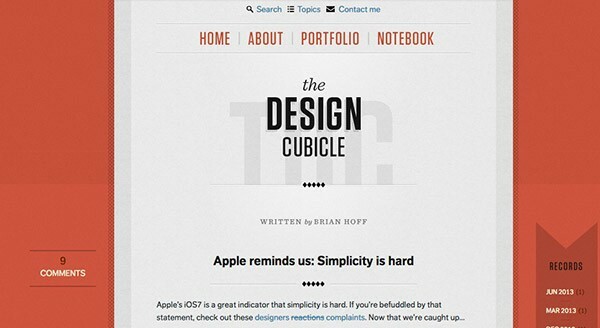 You run a popular blog, The Design Cubicle. Why did you decide to start a design blog in the first place? How did you get your blog to where it is now? What role did The Design Cubicle’s success play in your designer’s career? Would you advise other designers to start their own blogs? Why or why not? “I started The Design Cubicle few months before I left Apple. I started it as a means to interact. I read a lot of design blogs and I felt like I could add something to the greater story. My blog was my creative outlet in written form and my way to share ideas. Then, two articles of mine “hit the front page of Digg”, which got brought me a ton of traffic. I remember after that my traffic went up to 6000 visitors/day. It gained a lot of momentum for my work. I just kept on writing and sharing. Today, I wish I would have more time to write, I really do. I have so much less time for it now than I had when I started a blog: my days are filled with client work, I work on more complicated projects, and so on. I need to write more, though. Okay, so you have a successful design career, a popular design blog, what are the future plans of Brian Hoff? Are there any interesting new projects that are you planning to take on? What is the next step in your career? I want to build my own services and my own products. There are two ideas that I’m in the process of executing. I’d say that you can expect something new from me in the next 12 months. Last, but not least, if you could only one piece of advice to someone who wants to become a freelance web designer, what would it be? This is my one advice to anyone wanting to start anything (whether it’s to be a designer, a chef, or a construction worker): love what you do. There’s no way that you can be as successful as you want to be unless you absolutely love what you do. You can only get so far in life without this. It’s all about love. Keep in mind that freelancing isn’t easy. You have to consider whether you are good at getting things done, managing your clients, promoting yourself, and so on. Many people are much better employees than freelancers. Showcase your work online. Make sure that you have a decent looking portfolio which you can show to your clients. It’s even better if you include case studies that showcase your work process. Always focus on doing the best work that you can. This will help you get new clients through word of mouth. It will also keep your current clients coming back. Avoid working with low paying clients as much as possible. They are the hardest to deal with. Plus, doing low paid jobs will only get you more low paid jobs. Set your work schedule and stick to it. Overworking yourself is very counter-productive. Make sure that you get enough rest. Always make sure that you have money set aside for rainy days. There are times when you have a lot of clients, and there are times when you have none, and this is inevitable part of freelancer’s life. Don’t stress about it, prepare for it! Having a blog can accelerate your freelancing career. Providing value to other web designers helps you to become a recognized expert in the community. Keep in mind that running a blog is a long term project, though. You won’t get quick results. You have to love what you do if you want to really get ahead.